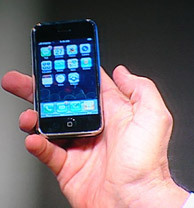 The iPhone made its second public appearance at CTIA Wireless 2007, in the lucky hands of Randall L. Stephenson, AT&T’s Chief Operating Officer. Randall even made a joke that he was testing the user interface, saying that was the first time he ever held the iPhone on his hands. It seems to me that Cingular (AT&T) being a partner to Apple for some time now, he must have had more time with the iPhone before that, but what do I know? Unfortunately, he chose not to demonstrate the iPhone to the audience, showing a pre-recorded video instead (no, it was not the same video shown at the Oscars). Randall said that one million people have asked to be notified about the iPhone, and even though that’s not a sales number, it shows us how much people are interested in Apple’s latest gadget. I have to admit I’m one of those people, and I almost can’t wait until June to get my hands on one. Read more at PaidContent.org, and check out the iPhone pics at Flickr. Apple is becoming like Google. I think the iphone is going to be a breakthrough in the media/tech sector contributing to Apple’s stock prices again. The functions and features look promising. Let’s hope it works just as well.